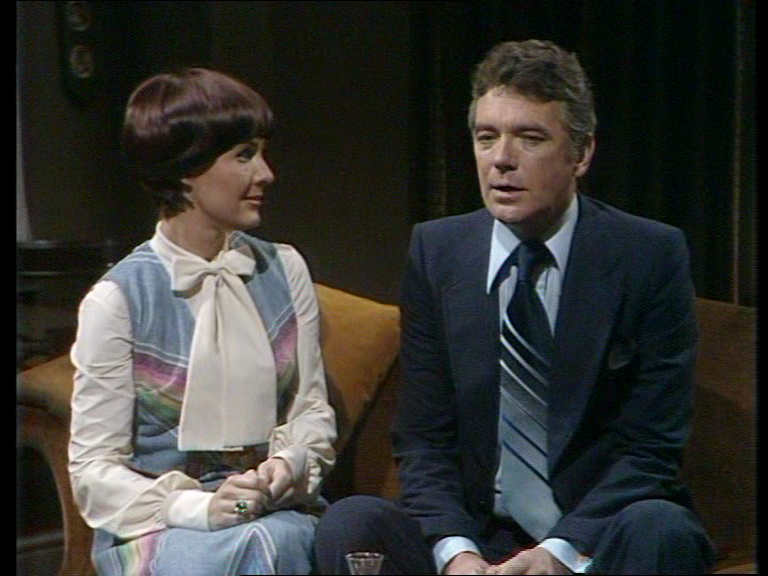 ‘Crossroads’: Episode 2674 (ITV, ATV, 20 January 1977) “David and Rosemary ponder on whether they should re-marry.” Directed by Darrol Blake. In July 2011 Leah Panos and myself had the good fortune to interview veteran television director Darrol Blake in his Barnes Bridge home. In a career that spans fifty years, Darrol started as a Design Assistant at the BBC in the 1950s, going on to become a Production Designer and then direct for the BBC, before becoming a freelance director for both the BBC and a range of ITV companies from the 1970s onwards. In Part One of our interview Darrol talked about working as a designer at the BBC in the 1950s and 1960s, working on a diverse range of programmes made in several different studios. In Part Two he discussed his experiences as a director for the BBC and at Thames Television. In the final part of our interview he discusses his experiences as director of hundreds of episodes of all the major British soap operas between the 1970s and the turn of the century. BS. You may be unique in having directed all five of the major British soap operas. DB. Oh, I doubt it, but yes I did, I directed Eastenders, Coronation Street, Brookside, Emmerdale and Crossroads. And others you won’t know about – I did Family Affairs. I did Triangle, although that was a finite thing where we did seasons rather than it being continuous. Another one of those finite series was The Cedar Tree, which I loved, an afternoon thing in the 1970s, which ATV did up at Elstree, and that was very posh. It was one of the first productions I worked on where we had a permanent set, i.e. they didn’t knock it down and set it up again next week, it took over a stage and it had the set on it. What I mostly remember about that was we all used to rehearse quite quickly and then dash next door and watch the Muppets being recorded. The Cedar Tree was set in the 1930s, a rather gracious period thing about a moneyed family. LP. That’s unusual for daytime television. And when I went for Crossroads, it was – God! That was recorded but… it took great courage for me to actually stop the tape and ask for a retake, because you then only had even less time being in a commercial company to actually record what you had to. I had a private rule that there had to be three fluffs before I would actually stop the tape. Somebody dropped something but didn’t break pace, somebody fluffed something, and if there was a third mistake, then I’d stop. But you had to go back to the top, that was the awful thing. And the scenes were so long, each programme had a recording break in the middle, so you had to do either Part One or Part Two again. But the scenery never wobbled – all this business about the scenery wobbling and people not knowing their lines is rubbish! But millions watched it. BS. 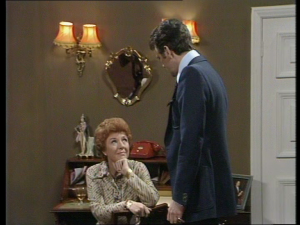 Its true, I’ve watched all of the surviving Crossroads episodes up to 1979 and the myth of things like microphones in shot actually happened a lot more in Coronation Street and BBC productions. DB. Yes, absolutely. But there was a weird sort of confidence thing. I remember that there was a marvelous girl called Sue Hanson in it who played Miss Diane, and she said, “Darrol, I was watching Coronation Street last night and, do you know what, they know that they’re in a success” And Crossroads was endlessly battered and endlessly criticized and of course everybody employed by ATV hated working on it because it was slated all the time. 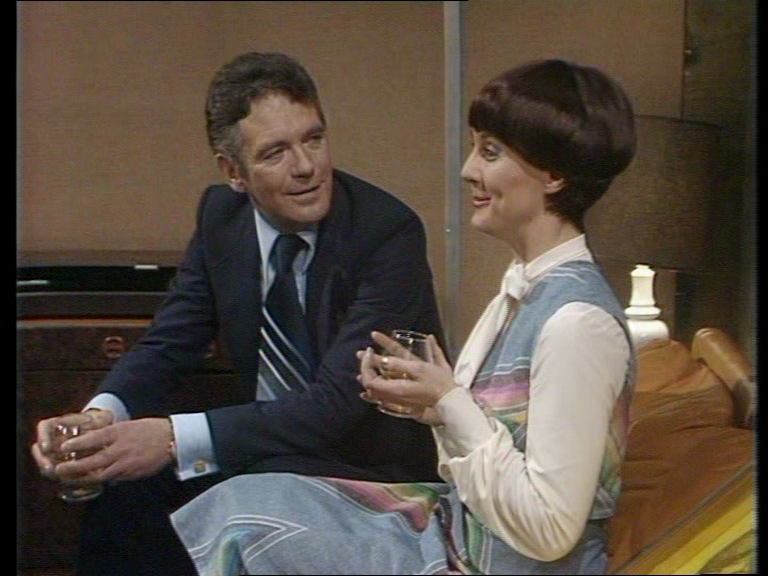 They would much rather have been working on the posh plays and the filmed dramas, or the big variety shows that ATV used to do. Ditto Emmerdale when I did that for Yorkshire, it was very much the poor relation. It brought in the money and it brought in the advertising and they the commercial companies had to do them, but the people who actually worked in the studios didn’t really enjoy it. Unless there was no big film or play going on and then they would say, “Oh well, better go and do Emmerdale”, you know. LP. What did you like about working in soap? Because it feels as though you found a home there. DB. Yes, because I’d been born and brought up in the studio it was my home. And I knew how to do it swiftly and efficiently and leave people standing at the end of it, on budget and on time. And I knew how to do it in such a way that I was relaxed about all that and I could take care of the actors and actually coax something out of them that perhaps they didn’t know that they did. I got hired again and again and again because of that – ‘The actors like him’, you know? So I enjoyed it. Having got into television at sixteen at Lime Grove that was where I was alive and where it was all happening. LP. So you always preferred to work in the studio? 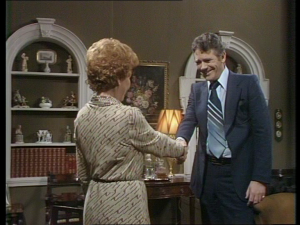 Talking about that sort of incomprehension, when I was up doing Emmerdale in 1981, they retransmitted Episode 1 of Coronation Street to mark Granada’s 25th anniversary and Derek Bennett, the director of episode one, was actually at Yorkshire Television with me doing some play or other. So I saw him in the bar the night after the repeat and I said to him, “Nice little show last night. Do you think it will run?” or some fatuous remark like that. And he said, “Darrol, I have to tell you, my entire team said, ‘Why didn’t you retake that bit where she stood in front of him?’” and he said, “It was live”, and they said “Yes, yes, but why didn’t you retake?” No comprehension! When I got to Emmerdale in 1977, it was established by then that you put up the pub set or the farm set and knocked off scenes for six episodes at a time. Most scenes were put in the farm kitchen so the cast ate huge meals. They’d have six breakfasts or six dinners and then break for lunch! LP. I’ve noticed that in Emmerdale the kitchen seems to work as a replacement for the living room in other soaps. DB. Oh yes, Sheila’s kitchen, it was. They were so hamstrung by the unions at YTV. I had two strikes in one day once – it was a nightmare. The electricians just ruled the place there in the seventies; nobody would do anything because they were frightened that the ETU would strike. Finally they became responsible for safety in the studios, which meant that they could stop production. You know – ‘That’s a slippery floor, stop production!’ Finally the YTV management talked to ETU headquarters and said that eventually they were going to have to stop production entirely, and they were told, well, fire them! ETU headquarters said fire them so they did. They then went on to rehire them all, but they got the message. Then when Thatcher appeared, the unions disintegrated, really. It was a nasty situation with the unions there. Of course, in most soaps the central location is the pub, and when Phil Redmond started Brookside there was no pub in the show. Later on there was a nightclub, but there was no emphasis on people drinking at all. BS. Have you ever read Dorothy Hobson’s book about the making of Crossroads? It’s the best description that I’ve read of the work of a director at that time. Because she went and stayed in ATV for a year, 1981, and she writes about exactly what directors, floor managers, the writing team, production and the cast all do, so you get a real sense of the timetable and pressures of working on the series. 1981/2 was the period when ATV became Central, because that’s when they sacked Noele Gordon. You get the strong impression that Central wanted to make high-profile, exportable ‘quality’ series like Inspector Morse, so they were continually annoyed that Crossroads remained so popular when it was an unwelcome inheritance from ATV. She talks about the problem of finding good directors for Crossroads. There were some safe pairs of hands such as yourself, but the problem was that they either got young tyro directors who wanted to make too much of an impression with the show which was counterproductive when it came to getting the show made on time and on budget, or they got old lags who were on the way down. DB. When I did it dear Jack Barton, the producer, had three alternating directors. Two of those were staff directors and he had a third post in which he was allowed to hire freelance directors and I came in ever and anon in that position. And the cast, it was Sue Hanson who said to me that every third week we get directed. Because the staff directors would just go, ‘that’s alright’, you know. So when Ed Lawton’s farm came into it dear Kathy Staff and Sue had to come to this farm where Benny was living. When we were in the rehearsal room I said, “It’s muddy out there, it’s freezing cold” and Sue said, “Ooh! I haven’t been spoken to like that for years! BS. There’s some truth in that. Dorothy Hobson does this work with audiences, where she suggests that the value of Crossroads isn’t so much dramatic but provides a service of showing viewers a world that they’d like to visit. DB. Oh yes. 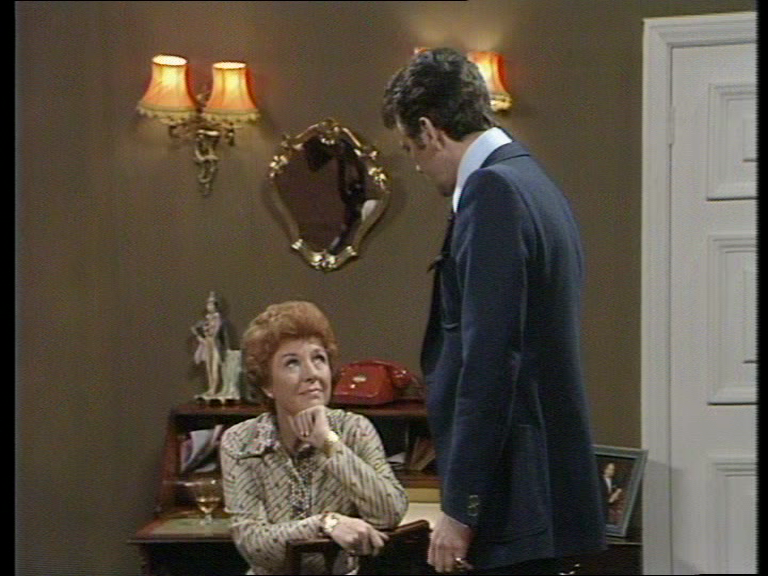 I always used to say that soaps had taken the place of the lace curtains, because in generations gone by she always watched what went on at 24 and her at 48’s got that sailor in again. They don’t do that in the present day, its given to them in the soaps. LP. There’s a bit of that in Brookside because of the set-up of the close being the main setting, there’s more awareness between characters of movements and goings-on. DB. Yes, I’d watched Brookside before I got there in 1987, and the thing that I noticed, because I’d been a designer and I was fairly experienced by then. The first thing that I do when I watch something is that my brain prints out the layout of the situation or the set, and if somebody comes from the wrong angle I know that they’ve come from the wrong angle, because the bedroom door’s over there or whatever. Before I went up there watching Brookside as it was transmitted, I couldn’t work out the relationship of the houses. And once you’re there, of course it’s terribly easy; you know that there are two there, two there, two there and those two, where nobody ever asked what those houses were for. DB. One house was the canteen, the other was wardrobe and make-up and the other one at the far end was the technical block with the editing suite and all of the rest of it in, and the one on the corner was Phil’s office with admin downstairs. And of course, the other thing was that all of the rooms were pretty small, so you had to take one camera – except for special occasions – and you had to take all of the furniture out in order to do close-ups. LP. Brookside started using the steadicam very early on, and I wonder if you had any thoughts about that. Had you worked with it before? DB. I’m pretty sure not, though I had worked with handheld cameras. There was a lightweight camera that had come in on Emmerdale. When I first came to Emmerdale in the late seventies they still had what I called the gas cameras, these bloody great things, and huge vans for OB, and the first thing that you did when you were looking for a location was find a car park to put all your stuff in, it was just ridiculous. Then later this lightweight camera came in, and I took it down a mine, and all sorts of places. But you used handheld for atmosphere really, for a fight or something that was supposed to be a bit jazzy, but that was a great advance for us at YTV. Phil is a brilliant producer and writer and everything else. I had employed him prior to that because one of the things that I did after Triangle finished was a couple of series of Tucker’s Luck. Literally on the last dubbing session for Triangle I went into the gents and there was Edward Barnes, who had been the studio director on Blue Peter all those years ago, who was by then Head of Children’s Programmes, and he said, ‘We’re looking for someone to produce the next series of Tucker’s Luck’ so I said, “Ah ha! I’m available” Of course, Phil Redmond, because of Grange Hill, was the creator of Tucker. It was the BBC’s idea because they’d got such a response to Tucker, the character had left school of course. The BBC on Phil’s side didn’t think that there was going to be any more mileage in him, but they got such a massive amount of “Bring Tucker back” mail and they couldn’t bring him back to Grange Hill, obviously. At that time unemployed teenagers were much in the press, they were all coming out of school and there were millions and millions with no work. So, the BBC thought that there would be something there for a series with Tucker and his two mates. We got a rather good director for the first series, and then the BBC decided that they wanted it to go on and on. It was organized that somebody else would do the storylines and the scripts, so I came into a fait accompli, but I went to meet Phil, because I needed to know about Tucker, who he was and what his creator thought ought to happen to him even though the storylines and scripts by somebody else were already there. So the assistant head of children’s programmes and I flew up to Liverpool and were given lunch by Phil and Barbara, his secretary from Phil Redmond Enterprises… Finally I got a word in and I said, “Tell me about Tucker – Who are his heroes?” “He doesn’t have heroes, he is a hero” and that was about all I got out of that meeting. LP. That was his initial aspiration for Brookside, to have an invisible style realized in a flowing way in as few shots as possible. DB. Well, that’s what I was still doing! But it wasn’t the fashion of that week. LP. How did working on Brookside compare to Eastenders? Because there are some similarities in the set-up of both series, although Eastenders obviously used a lot of studio shots. DB. Eastenders is just a conventional BBC production, almost a sitcom. I thought that their sets were brilliant – that exterior set of Albert Square is just wonderful. I think it looks best in the rain and grey weather, while Emmerdale looks best in the sun. I always thought that the guy who designed that should have got the BAFTA – I cut out a BAFTA and gave it to him when I worked on Eastenders twenty years ago, because he was still around then. I was not hired for Eastenders until after Julia Smith had left as producer. It’s the sort of thing that people remember: I certainly remember about people who have let me down in that context. DB. Oh yes! Apparently, if things were going along smoothly she would go and do something to upset the applecart on Eastenders to wake everybody up, weird things like that, quite a strange woman. LP. On Brookside, the design was quite clear, because they built real houses. It has that coldness that new closes do have. DB. They had terrible problems with the sound, because the minute that you take all of the furniture out in order to take a close-up of somebody it echoes, so they had to use these mattresses to absorb the sound, then they got rid of those and treated the ceilings with acoustic tiles so you could shoot in there. LP. Was the light a problem as well? The programme had a very cold sort of daylight. DB. No, because they used a particular sort of light switch that can merge with daylight, and you’d always use another great arc light coming through the window. Some of the lighting guys were better than others; some would do it in a flash while others would make a great agony of it all. Even before I got there Phil had licked them into shape; the camera crews, the lighting guys and the props – they all worked beautifully and really knew what they were doing. It was quite interesting watching how they would react to different directors, because when I was first there Phil was taking punts on quite tricky people – people who’d never directed actors before and people who had never directed television before. They all overran. There was one girl, [Ms. X], who was a beautiful actress who I was a great fan of – as an actress. She’d directed in the theatre, so she came onto Brookside, she must have done a course somewhere. She just had no idea whether it was Sunday or Christmas. The directors’ office at Brookside itself was as small as a corner of a room and was meant for the six of us, but fortunately at any one time you had one writing, one preparing, one shooting, one working at home and one editing and so on, so you were never really working in there together. I remember her being in there and she came in and sat down and said, “Darrol?… He comes out of the house… and I’ve got…” She couldn’t complete a sentence. She was just totally, totally stunned. I said, “Is it the location shoot?” “Yes” “What have you got to do? Have you got to get him from a car, into the house? What’s happening?” “Oh thank you… thank you…” I don’t know what I said, but I presumably got the cogs working in some way or another. I watched her first episode – God, it was sinister, it was so slow! It was bonfire night in the Close with a big bonfire, and there were several conversations, some of which had the bonfire in the background, some didn’t because it had obviously gone out by then, and it was so slow that you thought that a bomb was going to explode at any moment, there was so much tension. But it wasn’t, it should have been swift, light-hearted banter around the bonfire in the Close – I would have done it in one shot. She’d broken it down into what she’d thought was manageable bits… and then she just ran out into the night and left before the second shoot. So, guess who was asked to take over? So, when I was first up there, there were a lot of people coming in. Some could actually cut it and were okay, but others just overran, so whoever was following them in would have to pick up their scenes as well as doing their own. This entry was posted in Interviews, People and tagged Coronation Street, Crossroads, Darrol Blake, Interviews, Soap opera. Bookmark the permalink. I was fascinated to read these articles because I remember as a child at Pinkwell School (Hayes) Darrol would come to help Mr Young and Mr Miller with the annual play. He must have been all of 15 but to our 10-year old eyes he seemed very grown-up and sophisticated!